Yep, it's that time of year again! 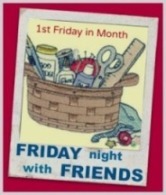 This awesomeness is hosted by Jo. Honestly it's one of my favorite things to do every year and this year is no exception. I'm showing off last year's Spring Mystery SAL (this year's started today!) because it is still so pretty to me. 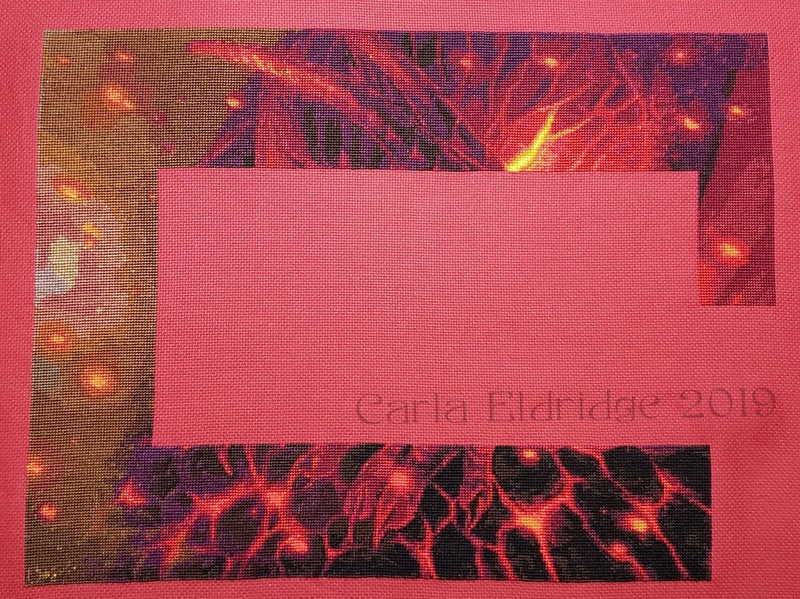 If wasn't working today, I'd already be begging Galdra to release the next section of pattern sooner. I was given a letter. I'm confident you are here for that. So here it is, all small and flat. 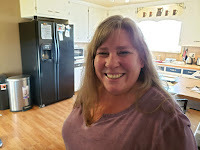 Now head on over to see Jo here. Have a Hoppy Day! Until next time KEEP ON STITCHIN'! WARNING: This blog post is really, really, really, really loooooooooooooong. That's right, I am a little competitive. 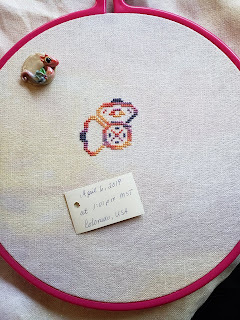 Who knew that cross stitch competitions would be so intense? Trash talking, trying to maintain one's composure when we get the win and failing, wondering what the next challenge twist or spot challenge will be.....it's stressful in a good way. 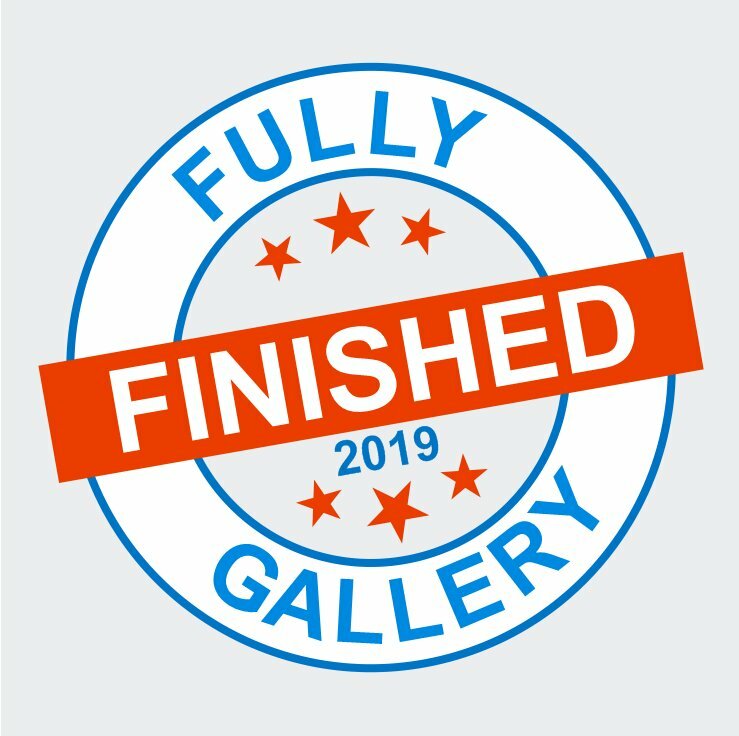 Thought I would share my accomplishments thus far so you can see what ridiculousness we have been up to. Also, we are still in the lead as a team, but one person on the other team has more individual points than our teammate who was in the lead. This was the 25 x 25 pattern SAL from Magical's Blog. That was a start and finish situation. My plan was to only do my SAL patterns, but dang it if the rules for each thing changed when they posted for the day...I'll show you that later. Naturally we have to post the starting picture and follow that up with an ending picture. It was this challenge that showed our team leaders a few things and later they fixed our wagon! By now it's a definite rule that all posts need to have the team hashtag or no points will be given. Day 4: Name that Floss! 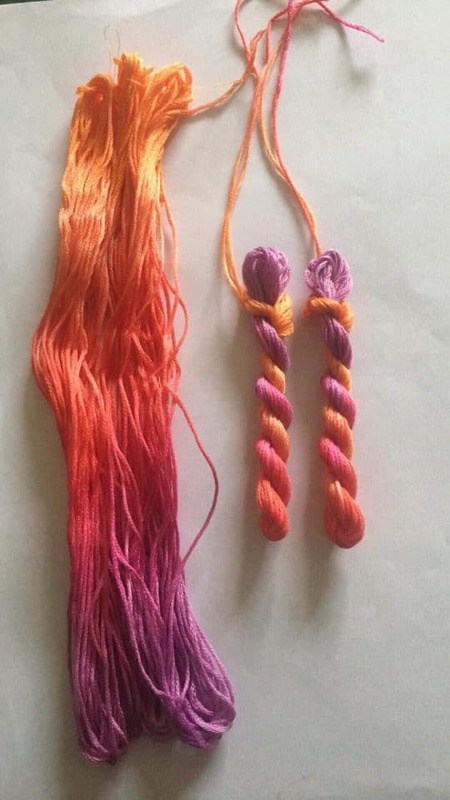 Gorgeous thread isn't it? This wasn't a spot challenge. We had a few days to think of something. 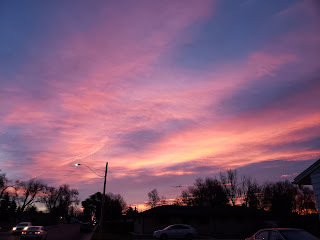 I thought of Rocky Mountain Sunset and shared a picture of why. Show me the size of your Jodyri Stash! Now things get interesting here. We have to post the starting picture. We have to include the hashtag for our team. We have to hand write the date on paper and make sure it's in the picture...told you things were getting "interesting"! 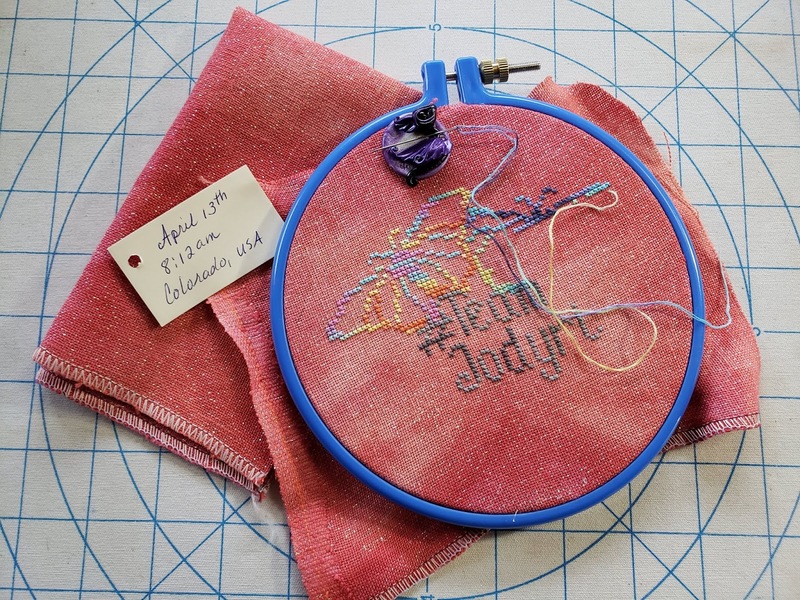 Once we do a bit of stitching, we have to post again with another handwritten note. See what I mean? It's super pretty. It's my favorite floss out of all of the floss I have made by Michelle (she's the owner/operator of Jodyri). This challenge was so fun! We were shown pictures of dogs and cats, stuffed animals, best friends, husbands, children....a definite fun one! I was torn...do I show Roy? Do I show Lucy? Roy was hiding in the basket of biscornu, so I chose Lucy who is so adorable and I had just taken the best picture ever of her. Dang it she's adorable! Just look at that happy face! I can hardly stand it she's so wonderful. After that bit of fun we were given the winner of Day 4's Name That Floss and it was my good friend Krystal! She came up with Sunset Hibiscus. A lovely name and the picture she shared was glorious. I think I was more happy she won than if I had, ha, ha. Okay, so in the team chat room, Michelle created two patterns for just the team. We had also decided en masse that we would change our FB icons to be the same just to mess with the other teams head. That happened and it was glorious. We are borg. It was awesome. For some reason, this particular morning I was tired, running late and had written the wrong date and time down so there were two start posts. Thankfully, by the end of my work day I was in even worse shape but did manage to throw in a few stitches for the end post. WEEK 2 CHALLENGE: Please add a picture to the week 2 challenge album of a design that you have had a hand in. 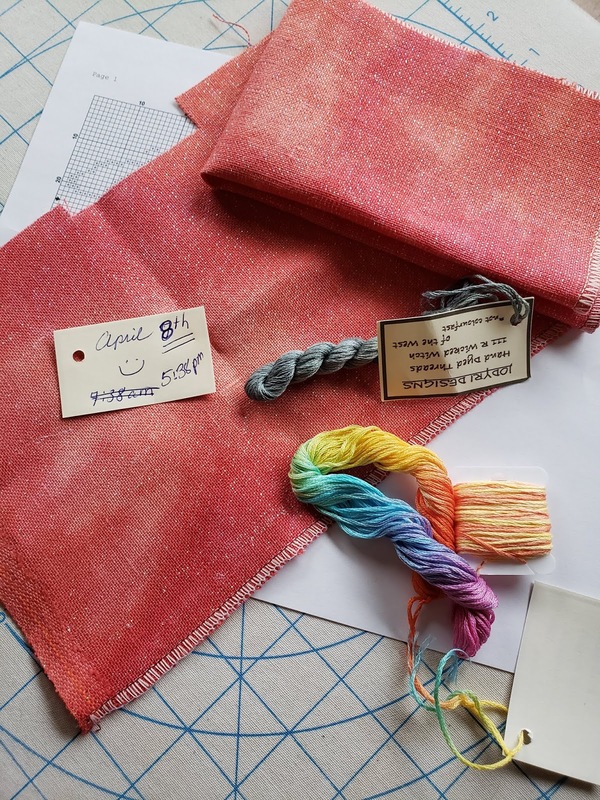 This could mean you designed the entire piece, changed something in an existing design to make it relevant to you (or the recipient), changed the suggested colours or used hand dyed threads and/or fabric to make the piece stand out from anyone else finishing the same design. It seems some people didn't understand the word album and then couldn't figure out how to add the picture. 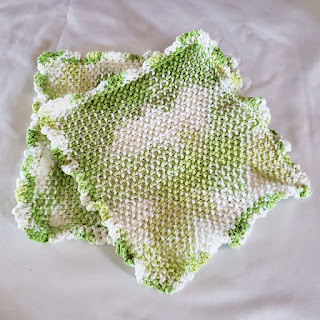 I shared this biscornu I had made for my friend Alonya who lived in Kamchatka (Russian Far East) at the time and it was the first time she and her family has received a post from anywhere other than locally. At that time Kamchatka was having some really hard times and living in Alaska it was news. I was happy to send them something pretty and it made the family very happy. I Frankensteined parts from two patterns and made up the rest. This is 90% of my stash and I have to say, looking at it like this makes me so very proud of myself. It took years to downsize from the room of giant totes to this and I couldn't be happier. Both teams tied this day. This was before work and I put in a few stitches and thought I'd go back to bed until 7:30 am. I was dog tired from work but still, that competitive rage fire still burned in me to get it done. This day we were told to go home early from work due to weather. SPOT CHALLENGE! This will award 5 points to the first commenter, 3 points to the second, 2 points for the third and 1 point for the fourth. Which is your favourite SAL from either Kim or myself (so it has to be KLT or Jodyri but does include those designed by Vik at Jodyri as well)? 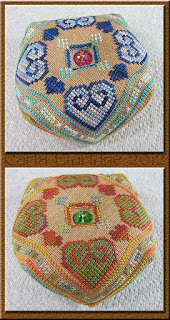 You must post a picture of the SAL stitched by you to qualify and if it is finished you earn double points! GO! Drat. Nowhere for me to go as I had neither. Not doing well on the spot challenges but luckily I have teammates who are. Our team is still in the lead and still winning. Now this is where I, for some reason, start getting grumpy about the new start situation. There is a twist to this new start. It's getting brutal! 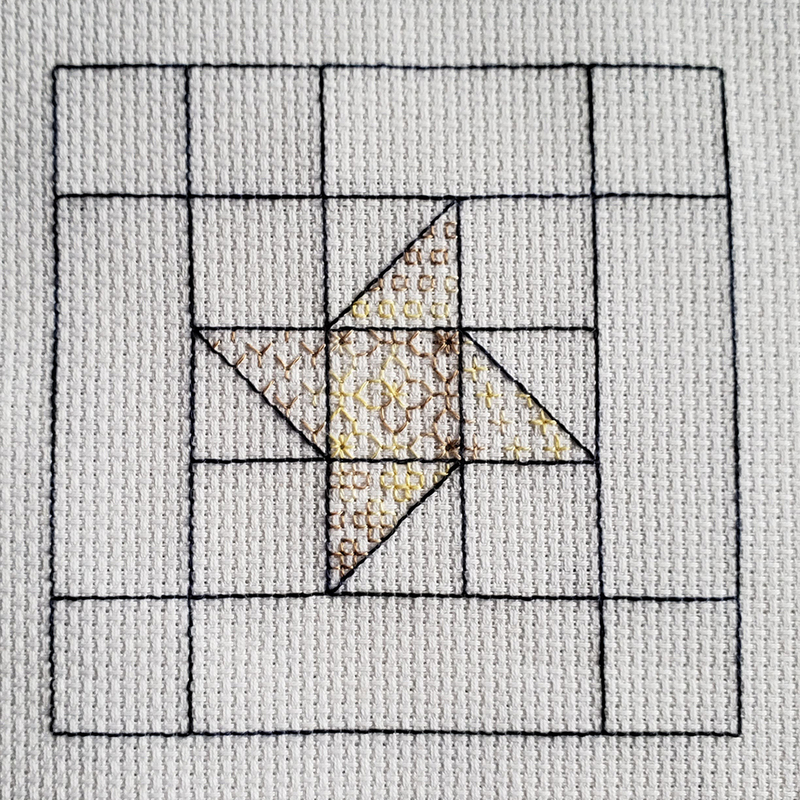 The new start had to be on a clean, un-stitched on piece of fabric. I spent the day at work trying to think of what this could be. ALL DAY LONG, pondering. When I got home from work it hit me: I could stitch one of my Frosty Forest patterns. There are advantages to this new start; participating gets 10 points, stitch 200 you get 15 points and over 400 you get 20. Yep, 63 stitches. It's all I could do because of time constraints. See, the challenge starts about noon UK time on the day of and ends noon UK time the day after so that everyone around the world can have the time needed. Pretty smart thinking on their part, but as you can see, I didn't have enough time to really go crazy stitching this one. We still won this round as a team though. #teamJodyri 525 points, #teamKLT 480 points. The rules state you must own it and show it on something you are working on. My original plan was to show the one I owned (purchased from someone else) and show it with a picture from the KLT website as the same minder is now there as well, and it is my favorite on her site. Apparently, we are not allowed to be smarty pantsies about this. POOP. #teamjodyri did not win this round and closed the gap slgihtly on the total point difference between teams. We are still winning overall. Pfft...too easy and I'm grateful! I almost had a hard time deciding which one as I now have a few to choose from. 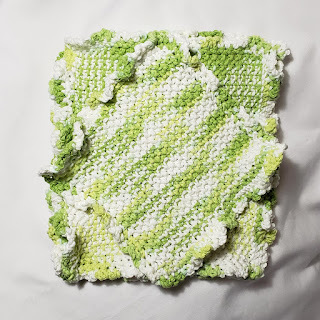 I decided to blog first before giving this one a finish. I'm hoping to finish all of these new starts by the end of the month. My SALs are on the side line for this month. My current WIP rotation is on the sideline too. Here is a shot of the other piece I could have worked on, it's a larger version of the mini Jodyri. 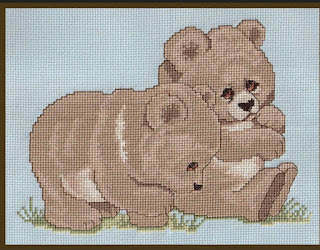 I have another opportunity to stitch on this one later this month which makes me happy. However, there is yet another new start AND two TO BE ANNOUNCED situations in the competition. I'm nervous about those...what horrible torture will the team leaders come up with?? For today, I'm going to the movies with a girlfriend to watch a chick flick and gorge on popcorn and soda. It will be a nice break from work and frantic running around doing things for the competition. When this competition is over I will go see Endgame....it only seems right. Hopefully you haven't given up on this lengthy blow by blow of the KLT vs Jodyri competition! I will try to do a shorter version next time, maybe four days at a time to keep it interesting. Please help me to hope the snow away and let spring come on for real! It seems we deserve it after this winter being so heinous. Be safe my precious friends. 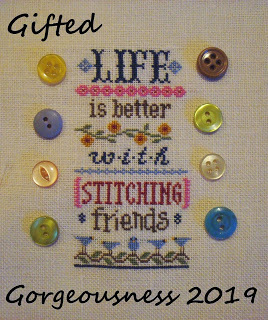 Until next time.....KEEP ON STITCHIN'! Oh my gosh! It's all I think about! I have to get up early so I can post the day's challenge and chat with my team (#teamJodyri). At work, I check into the team chat to see what crazy idea everyone has come up with and after work it's back to the chat and to the FB group to see what's been posted and get an idea on who won that day's challenge. If you don't know, here's the story: Kim who (owns and operates KLT Charting) and Michelle (who owns and operates Jodyri Designs) decided to have an all out brawl. Stitchers chose their team or were placed on a team and off we went to do the daily challenges. There is a list of what to expect you will have to do each day, however, there are tweaks to the listed item. One day is NEW START. Post the before picture, but you have to write down the date on a piece of paper and take a picture of that and submit. Then later, after some stitching, you take another picture with handwritten date and reply to your previous post. Let's not forget the spot challenges! I was at work when the spot challenges happened both times and missed out on that. But we all changed our icons to the same picture to show our solidarity for the team. One of the best parts of all of this was "Name the New Floss" and my friend Krystal won! That was an extra 10 points for the team! Overall we are winning, but there were two days in there where the other team won. Naturally we put a stop to that nonsense. Between work and this challenge it leaves me very little time to blog everyday. This has been bothering me so much. 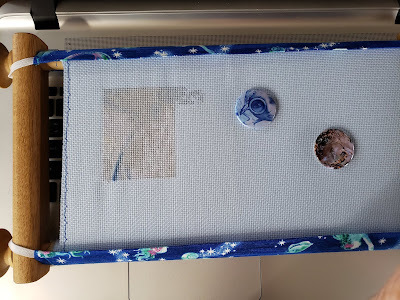 Here I thought I'd have a nice break from frantic stitching and things after the UXS Stitch a Thon, but I was horribly mistaken. For those of you who would like to get in on this fun, you can join us at KLT VS JODYRI on FB and by all means.....join #teamjodyri! Today we are posting pictures of our stash, some of our stash or all of our stash. It's an easy one. Seriously, it's all fun and laughs. As the Cajun Cook used to say, "I guaranteee!" 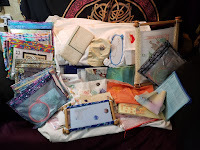 Yesterday was a darned good day for stitching! 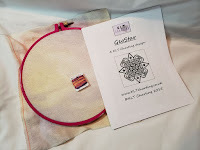 I started and finished the April NFSAL which will be posted on DeviantArt in the Stitching Pirates Group on Saturday and five days later it will be posted on Magical's Blog. Sadly, I cannot show this one since it's not "public" yet but I can tell you it's a gorgeous small pattern. 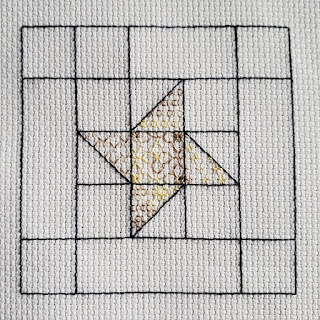 Then I stitched up the March 25 x 25 pattern from Magical's Blog. It's so hard to photograph sparkly stuff but I did the best I could here. I don't think I did the backstitching justice because it really is cool looking. 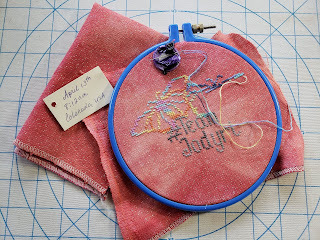 This is how it works though; give it a try, learn from your mistakes and be a better stitcher next time. 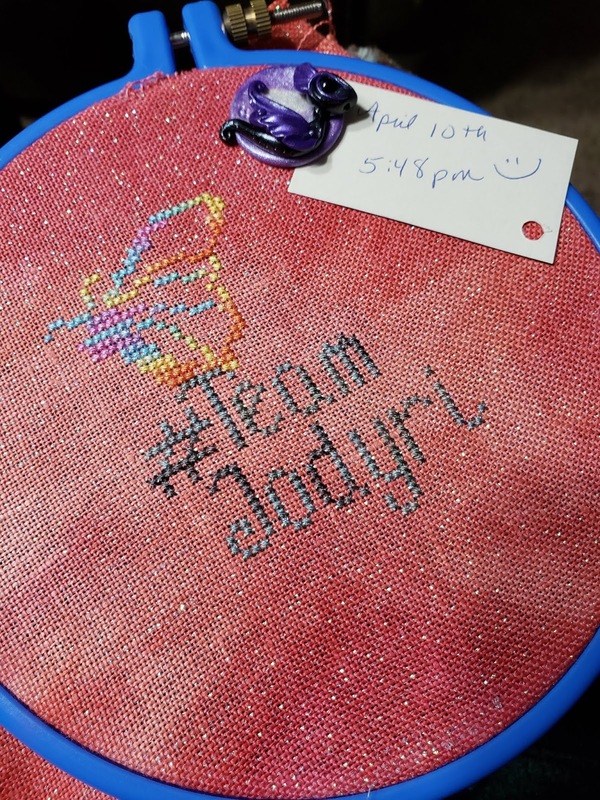 For some insane reason I signed up for the KLTDesigns vs JodyRi and am on #teamJodyRi. Looking at the list I realized it won't be difficult to do some stuff daily...like today was show off your stitching corner. Super easy! Started a new contract job today. My stitching time will be reduced significantly but I'll keep trying! Now I'm just tired from the first day and want to get some stitching in before I pass out. Okay, it feels weird to have missed five days of blogging. 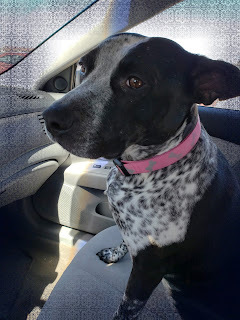 I didn't run out of words or things to blog about, it was all Lucy's fault. Okay, maybe both of our faults...either way it's now today and blogging is happening. 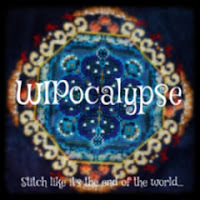 Yesterday was the WIPocalypse post date and the question was: What newer designer and product creators (fabric/floss) have you discovered and recommend? To be honest, I have done my best for the past two years to NOT find new designers or product creators. Why? Well, it's a budgeting concern and a desire to stitch from stash. It would be great to introduce the next up and comer into our community, but my eyes are closed! 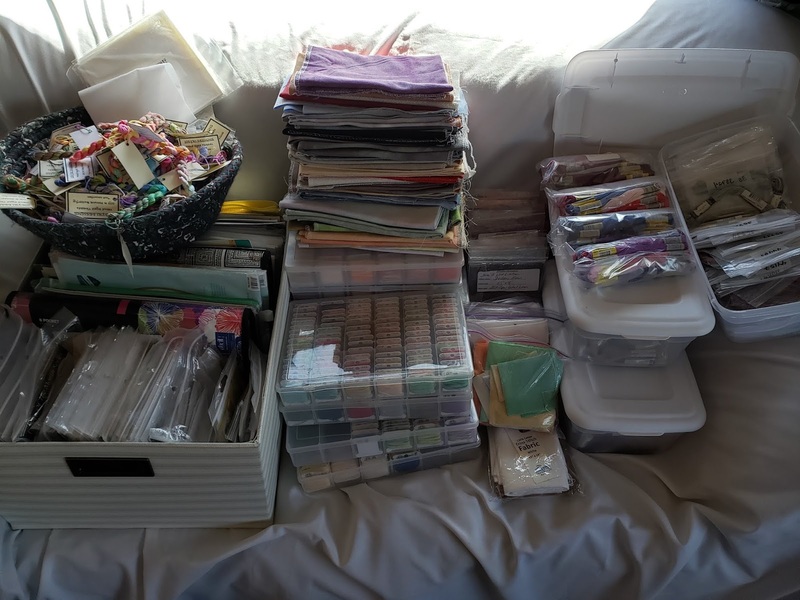 I spent five years downsizing the hoarder's den of cross stitch and crafty stuff to a more manageable amount. Some of you are probably thinking one of two things, "OH HOW COULD SHE??" or the second, "Am I a hoarder too? I feel ashamed!" I'm hoping you are all with the first, but there are some who wonder why they have so much stuff. 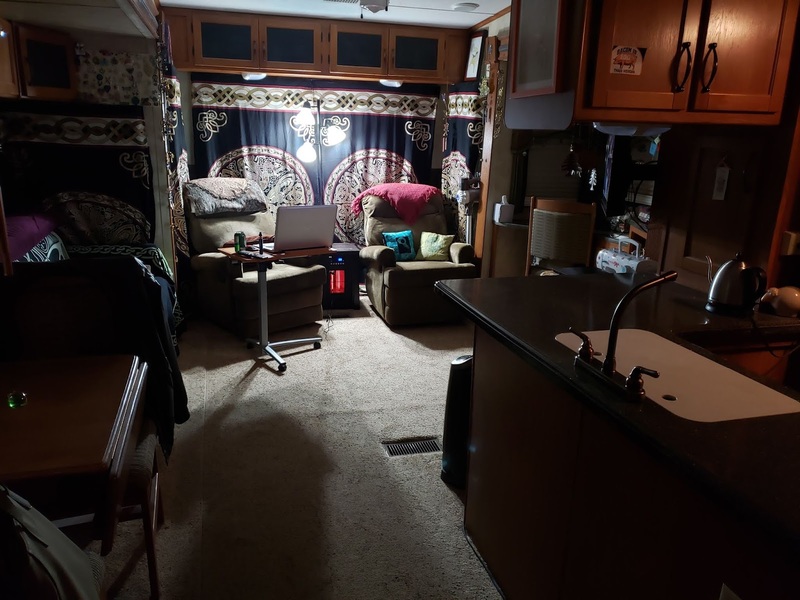 I was of the second and needed to downsize for the plan of tiny house living to work. Therefore, no looking for lovely new designers or fabric and floss makers. I'm confident that once the horror of not diligently shopping and acquiring haul is offensive to some, but there are more than tiny house reasons for not having so much. 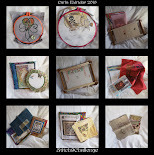 On a brighter note March was the Unconventional X Stitch Stitch A Thon! 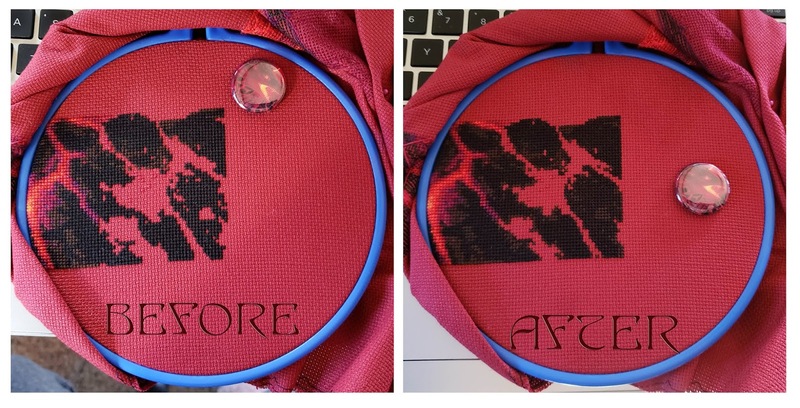 Thordak saw most of the love and the final result was 3372 stitches for the final week. Two page finishes and a good start on the next page. Not too shabby really. I'm pretty sure I made second place. 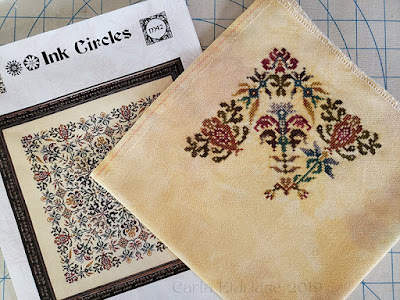 Last Tuesday was the Blackwork SAL March pattern 3 release and I had already stitched that because, like the Mamluk part 3, Magical had not taken a picture of the March part of her stitching so that had been done as well. I believe April's pattern will start the blue color and I'm very excited about that. It's going to be a pretty little piece when finished. During all of the craziness of the stitch a thon, I accidentally signed up for the TeamKLT VS TeamJodyri challenge. I thought I did some trash talking but there's some going on in that group which is hilarious. There is a list of things that have to be done every day and today is "New Start". This caused some concern since I honestly don't want to do a new start. 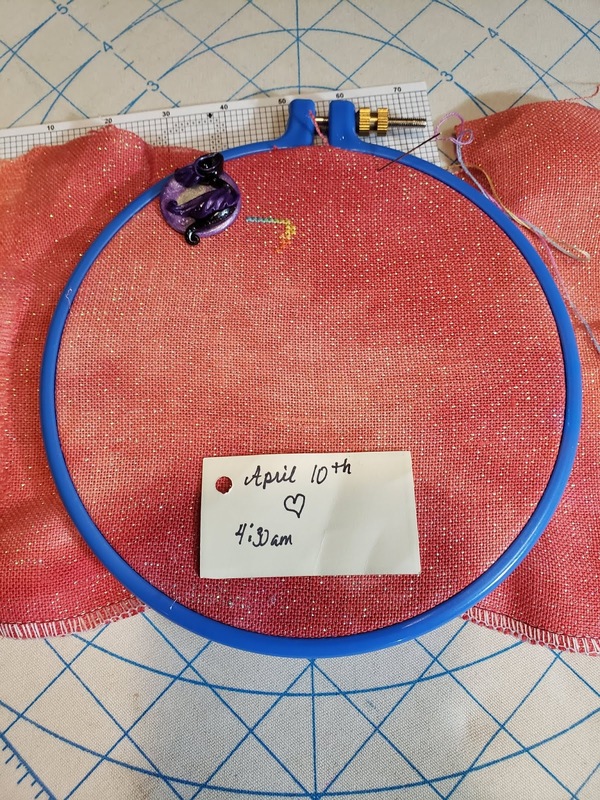 Talking to Magical, who is also participating, helped me to see that I could catch up on some of the missed patterns from her group from March as my new starts which is pretty smart. Just so you know, I am #TeamJodyRi. A great thing since I have one of her patterns and tons of her floss and fabrics. Win, win! I'll be reading blogs and commenting for the week I have missed and before I even delve into that, I really hope to find everyone happy, healthy and safe. If you read yesterdays blog post, you will know that I'm trying to stitch like a machine so I can win the stitch a thon but Lucy isn't having it. My son is in Ohio for the week so it's just the two of us. At 7 pm I went into my son's house where Lucy had been put earlier and decided it was time to give her a bath. She goes from not smelling to smelling horrible in a snap..which is weird because she smells nice for a week or so after the groomers get her, but this time BLECH! Struggling in the bath, soapy, rinse, forgot the towels, went and got the towels, Lucy jumped out of the tub and gave a mighty shake, bathroom is now soaked, put towels on Lucy and dried and dried. Considered blow dryer, but Lucy decided it was time to play tug. I sat down to watch a movie and normally Lucy gets on the big chair with me and snuggles in, but for some reason she just wouldn't settle the heck down. I have no idea why she's acting all needy when we are literally wedged in the big chair together, I'm scratching and petting and yet she's still unhappy. Finally she gets off the chair and wanders off. Usually I worry about her wandering off...like a child doing something bad...it gets real quiet when the sneaking is happening. So I get up and look for her. The first time I look for her she's coming up the stairs from the basement looking like she did something bad. Checked out the basement for surprises which would have been odd since she had been outside for "business" just a short time before. The second time I looked for her, I found her in my son's bed. Apparently it was time for her to go to bed. Shut the light off and finished my movie. I think she misses her boy (my son) and just wants to be where his smell is. 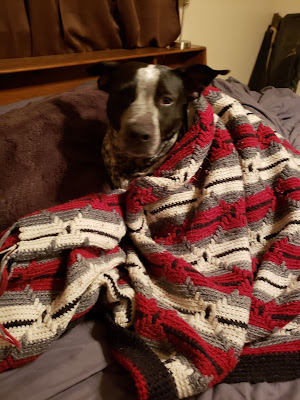 In case you are wondering, Lucy will "dig" and "bite" her blankets until they are positioned perfectly. Sometimes she will stare at you intently until the blankets are put on her, but this is how I found her....ready for bed, blanket and pillow at the ready. She slept until 10:30 am this morning. She's like a dang teenager! 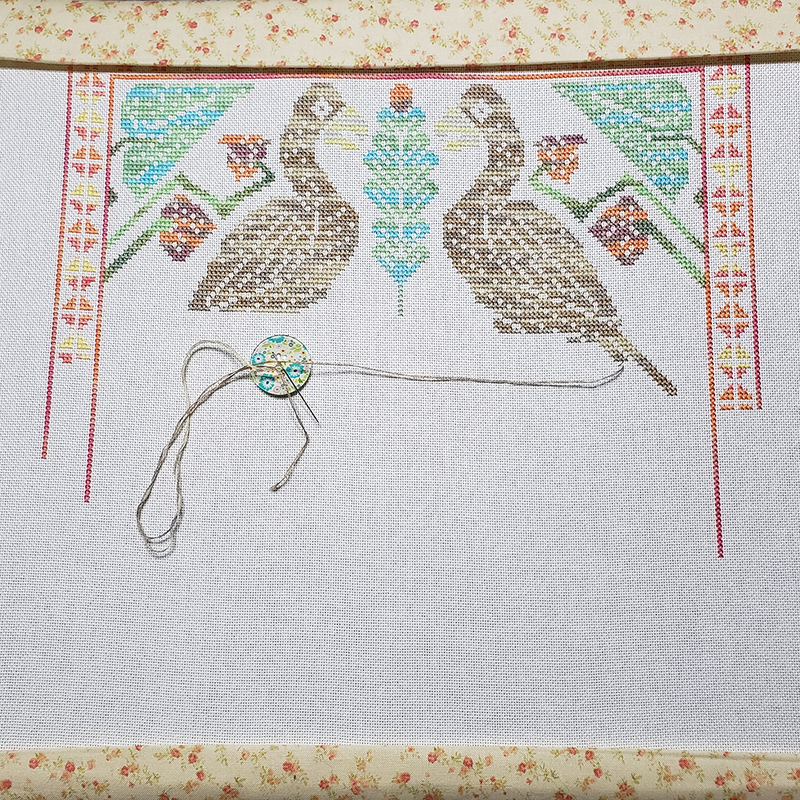 As for my stitching, half a page done which makes me sad because I can do better than that! It's alright, it's only Tuesday and I'm feeling better about stitching today. I'm wondering if Lucy is in League with the other stitchers participating and doing her best to keep me from stitching. Pretty sure that's her evil plan. Hope everyone is getting their stitching in. I haven't read blogs lately and I so want to so I can see what you have all been up to. Stitch A Thon is On! 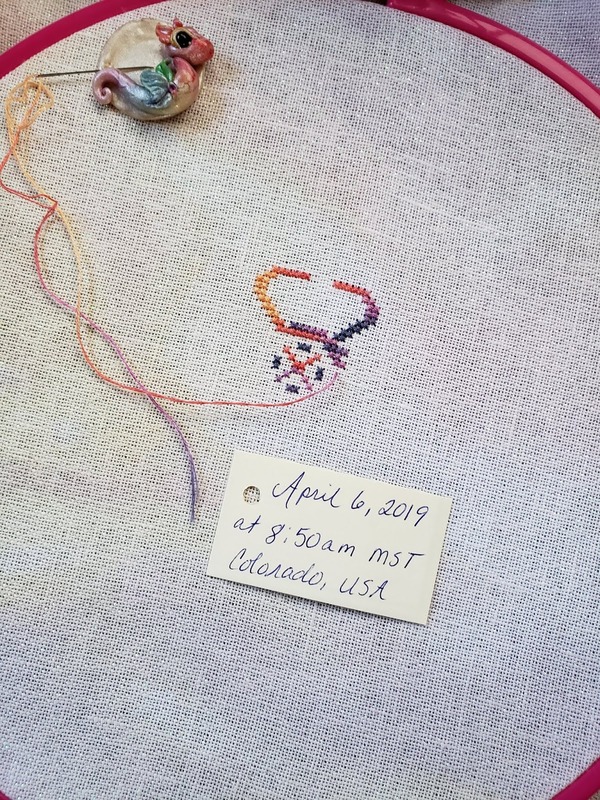 Technically the The Great UXS Stitch A Thon started around 6 pm last night in my time zone. Not thinking about that, I worked diligently on a page finish. 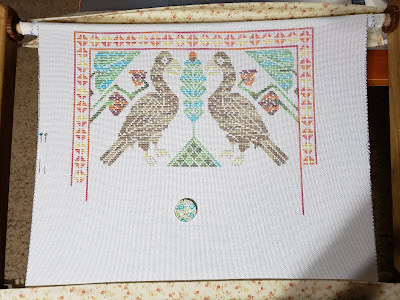 Once finished, posted to the group and that's when I saw the questions and comments and the notification saying the Stitch A Thon was "happening now". 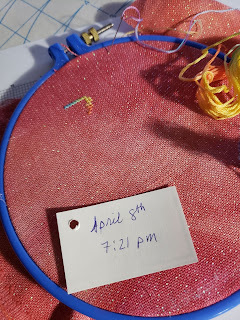 Because I wasn't paying attention to how many stitches I was doing for the page finish, I couldn't even begin to count that, so claimed it as a "freebie". However, it's ON, like the DONKEY KONG. Earlier today I glanced over at my floss box and felt it looked incredibly photogenic and took a quick shot of how awesome it looked. 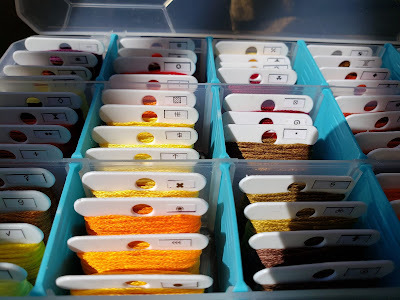 Because I have approximately 43 million UXS patterns, I have plastic bobbins with the symbols on them and it makes it easier and faster to stitch when I don't have to keep looking at the color key. 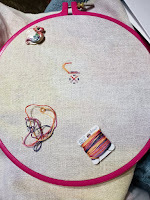 Pretty sure none of my competitors (okay maybe two) read this blog so this trick will go unnoticed for the most part during the frenzy of the stitch a thon. There I was stitching away, being repeatedly interrupted by Lucy who wants out, wants in, wants out, wants in, wants out, wants in, can't decide what she wants, gets rubs and hugs, told she smells horrible, wants out, wants in, sticker in the paw, lays on the floor next to my chair and quietly whines, wants out. This went on until 15 minutes ago when I put her in the house to eat. Anymore interruptions and whining and I might have to yell at her which I don't want to do. 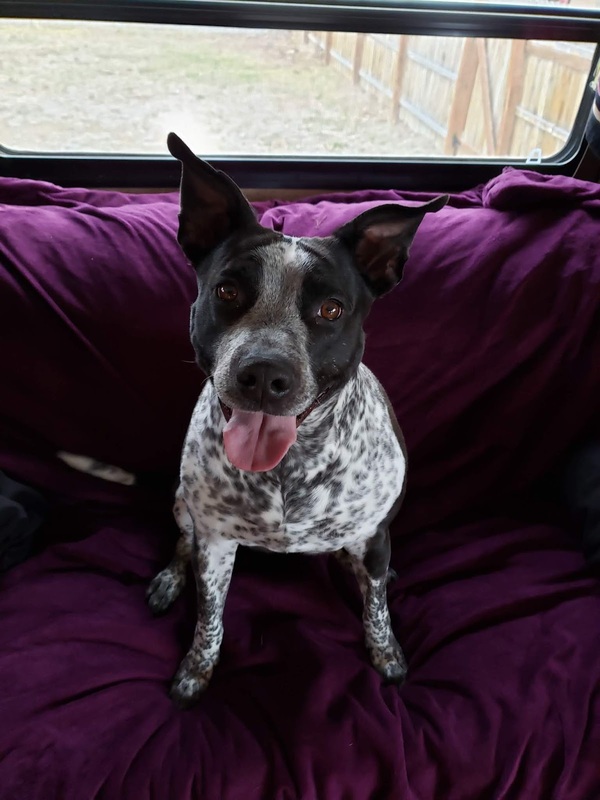 Yelling at a dog usually doesn't do any good (firstly) and sometimes rescue dog associate yelling with bad things and react badly (secondly). 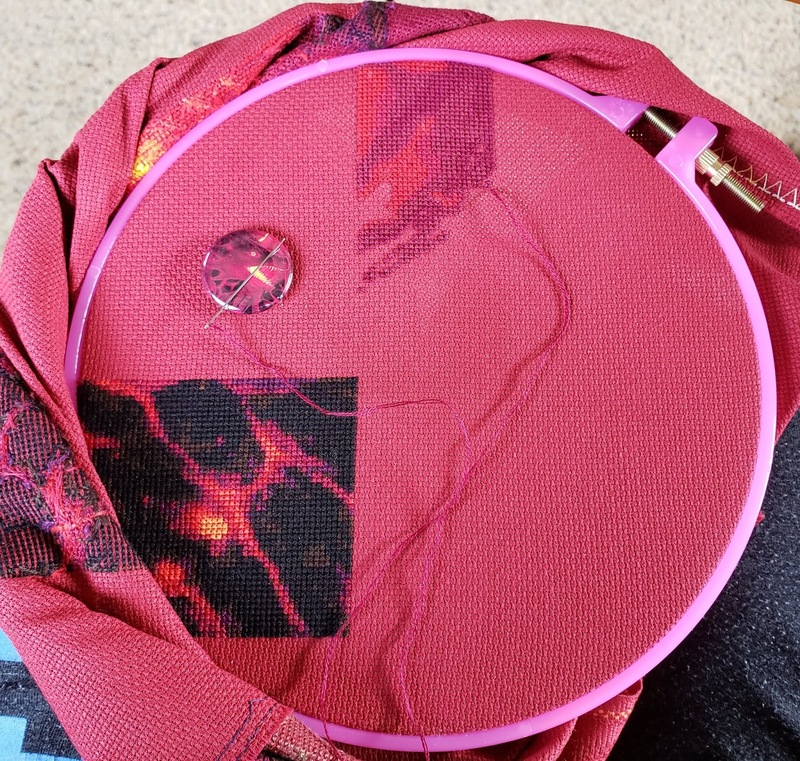 For now, I'm going back to stitching, hoping the berserker mode will kick in at some point and my needle flies! 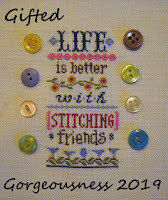 Until next time......KEEP ON STITCHIN'! Maybe it's time to get some tests done again. So tired today that after the dog park, Lucy and I took a five hour nap! She didn't mind, but I sure did as I had things to do. 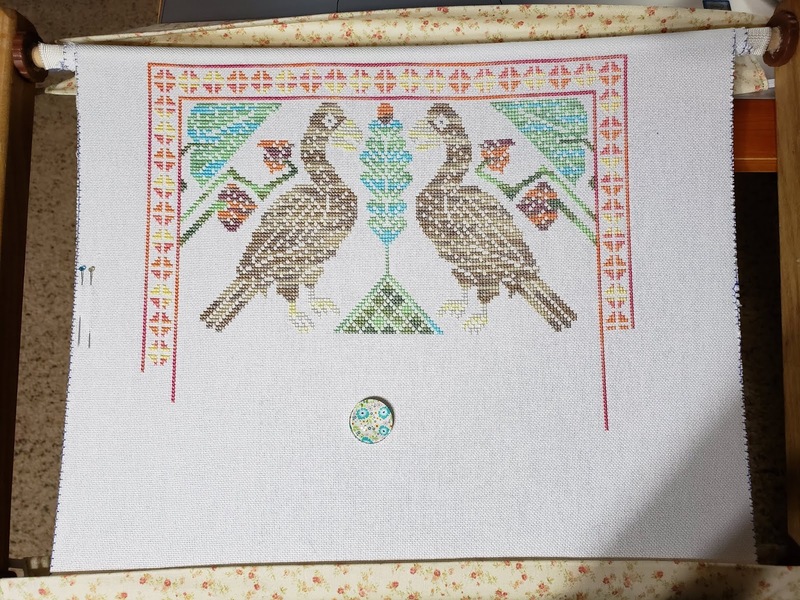 One thing I did do was finish part 3 of the first band for Weaver's Bird SAL. There's a dividing band under the birds that I will stitch when the next section comes out. 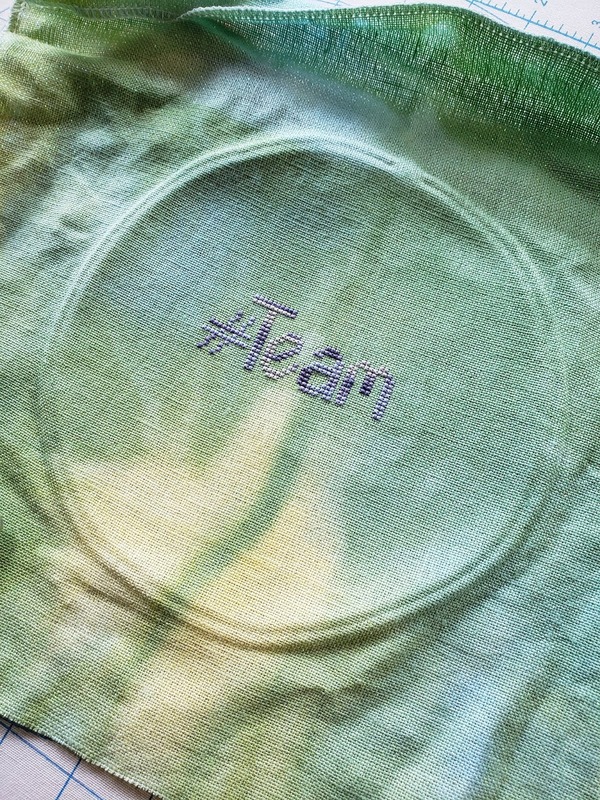 Preparing everything for the UXS stitch a thon that starts on Monday. I'm so excited even when I'm napping! I hope your Friday was glorious! Until next time...KEEP ON STITCHIN'! 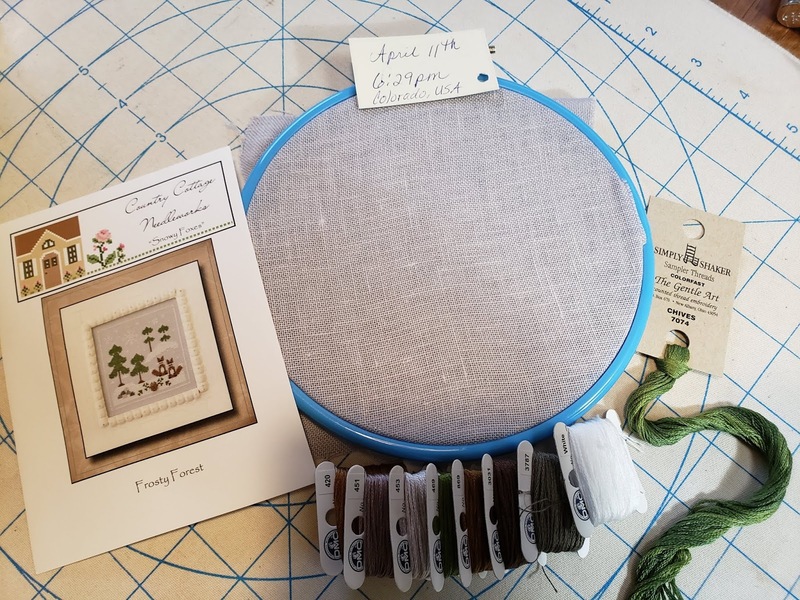 Yep, it's Thursday and that means tonight Nancy and I will be stitching together while watching Critical Role. Okay, so Nancy still lives in Canada. I now live in Colorado. I haven't hugged Nancy since she and her folks went to Juneau, Alaska, where I gave them a personal tour of the area several years ago. 10 hours was not enough time! We barely made it back to their ship (ten minutes to spare) in time. I should have just kept them and taken them home with me, ha, ha. But, with good friendships, we still chat while we watch our shows together. It's nice to have that one person who "gets it" as the saying goes. Tonight I'll be stitching on Weaver's Bird SAL and have made a little bit of a dent with some tail feathers already and expect to finish this tonight during the show. I did make another washcloth of a more manageable size and finished the ruffle today. I really want to make more tonight but stitching must be done! Placed on top of the larger ones you can see the difference in size. I also love the striping. Sadly, after a year or so of use those stripes will fade. Lucy and I have spent lots of time at the dog park yesterday and today. It was hot yesterday and hot again today. When we arrived today everyone was leaving so we had the park to ourselves which was weird but fun. Wore each other out stomping around and around. We were pooped when we got home and Lucy proceeded to hog the couch, did NOT demand belly rubs but promptly began snoring. Can't wait to go tomorrow! Have a great night, call an old friend and tell them how much you miss them! Yesterday I did finish the 200 stitches on Pirate Ship and Thordak after several wonderful interruptions. Wonderful, in this case, is not sarcasm but honest to goodness WONDERFUL. A few sales in my Etsy store....and Lucy. There were some stitches that were done a few years ago that needed removing and re-stitching so the new stitches could be stitched in correctly as well. Gosh it's looking so good! Pretty soon all that will be left to stitch are waves of water. All the stitches done in Thordak have now left me with my favorite part of these particular pages...the lavaaaaaaaaaaaaaaaaaaa. I love how the colors go from purple to bright yellow, oozing out of the black. After the stitching was done, Lucy came out for a visit and decided that she needed deep tissue belly rubs so she could poop. I'm wondering if she really needs the belly rubs or if she has concocted an elaborate ruse to make us think that she's in dire need of belly rubs to help her digestion. Either way, the poop happened and she was bouncy and happy again. Still feeling skeptical, but who am I to deny such a great dog a belly rub? It seems she was also motivated to begin digging a hole for the new swimming pool we didn't know we were installing. My son laughed and said, "Nice try Lucy!" Since yesterday was Tuesday, it was time for Nancy and I to watch Talks (a show talking about another show called Critical Role). It's only an hour long, but I did manage to finish a washcloth that's been on my knitting needles for two years. I'm almost out of washcloths! In 2012 I taught a co-worker how to knit. 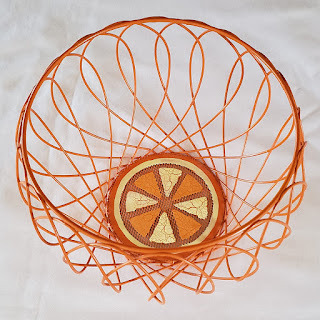 She was so thrilled with the learning that before she left Alaska and moved to Florida, she knitted a bunch of washcloths for me and bought this very cool orange basket to put them in. As you can see, the washcloths are on their last breath. Let's not forget that there used to be so many more! For some reason I don't usually have a dishwasher, that job fell on me most of the time. I'm down to three but I can say those washcloths have done their duty admirably! 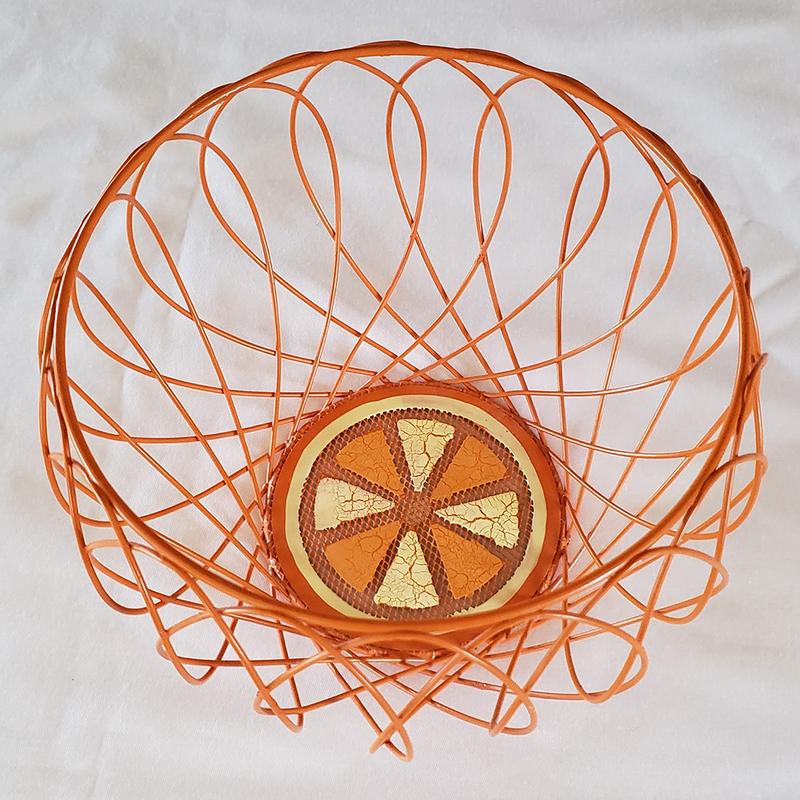 This is a great basket that's been in my various kitchens for quite some time and will continue being there until the end of time! The entire gift is so very treasured. 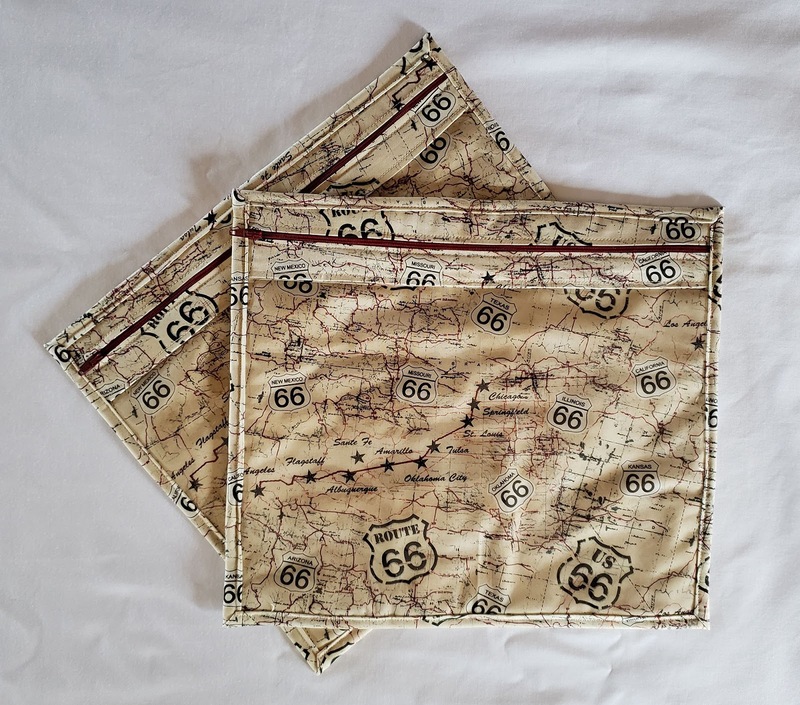 Here are the new washcloths. These two are a little bigger than I'm used to. The cloths I make next will be smaller. Since I have a giant spool of the cotton, I'll keep making the washcloths until the spool is devoid of cotton. I believe it's Sugar and Spice. 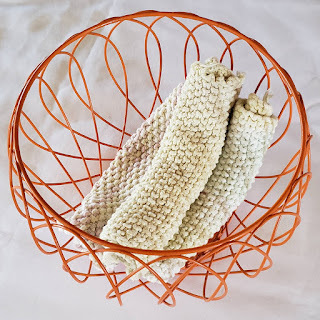 I cannot tell you how much I love these washcloths compared to the scrubby sponges, terry cloth and whatever else they are being made of today. 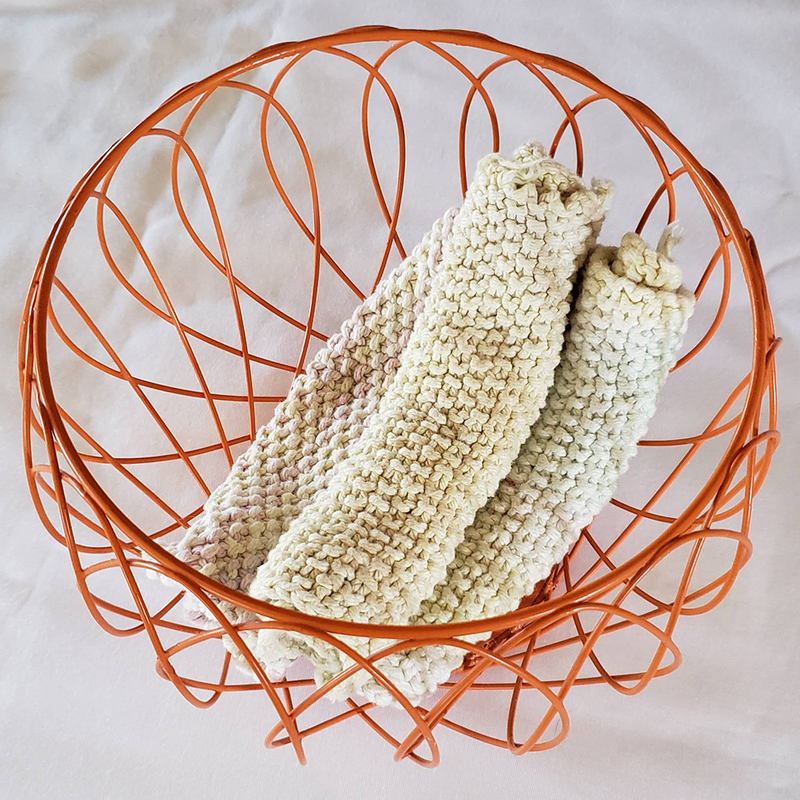 The seed stitch helps with that little bit of scrubbing everyone needs to do, the cotton holds up under duress, and I can't wait to have a super full basket of washcloths again! I have some things to do today so I'm not sure any sewing will get done. This bothers me as I'm off my schedule and need to get back on track. It will happen eventually. Hopefully your day is spectacular in every way! No blog yesterday. The weekend caught up with me. By 6:00 pm I was ready to call it a day and the sun hadn't even gone down yet. I puttered around for a bit, but only made it to 8:00 pm before I called it a day. I did stitch which was great! 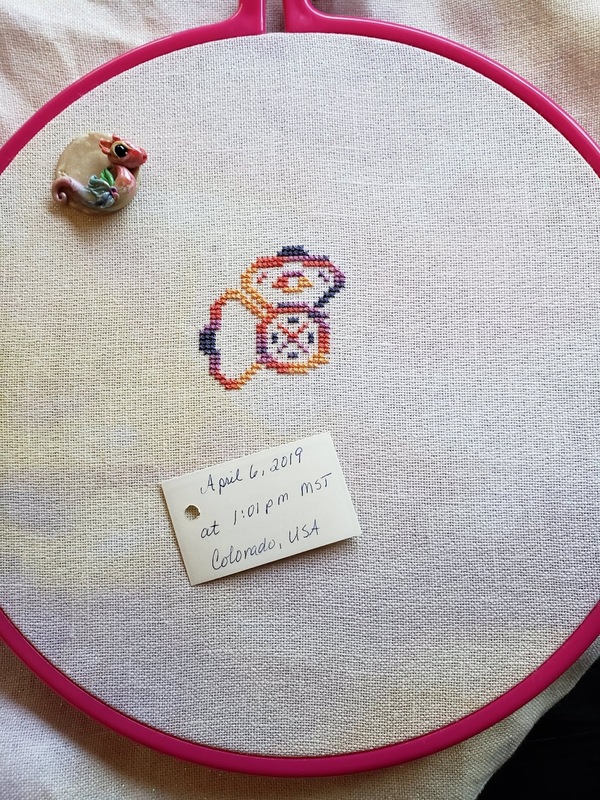 Yesterday was the start of the third week of the UXS Stitch a Thon where we stitch 200 stitches on our project and post before and after pictures. BAM was the first one up and I'm amazed at how much gets done with just 200 stitches! Today I'm more refreshed and ready to stitch on Pirate Ship and Thordak. It's exciting! I may even get to pick up Weaver's Bird SAL, but can't make that promise to myself or to you. Next week is full on Berserker Stitching Mode! 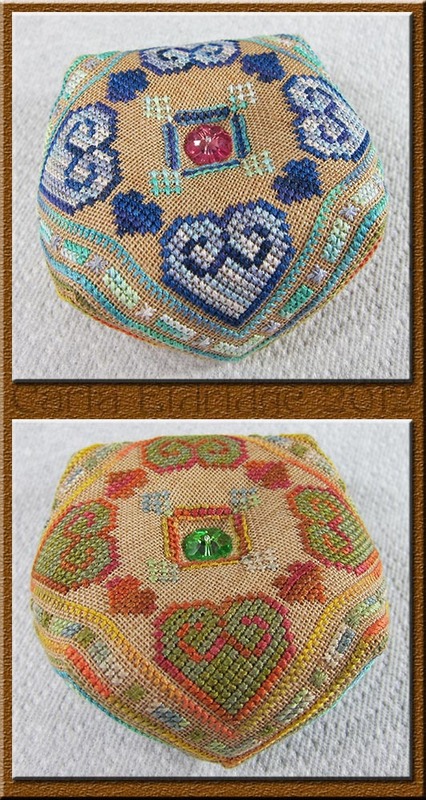 No measly 10, 100 or 200 stitches....FULL ON CRAZY, FAST stitching. I'll be well rested, hydrated, fed and ready to rock and roll. Quick tip: Do not combat clean a 4 bedroom house and a 36 foot RV in the same day. Pace yourself. 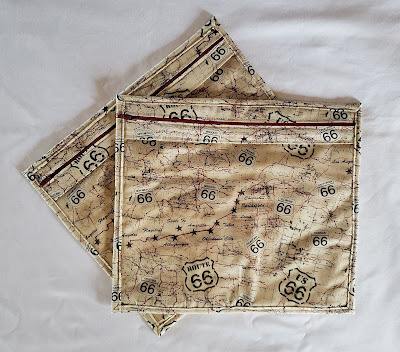 It also seems I forgot to put my Route 66 Project Bags in my Etsy shop, so I did that this morning as well. I love the fabric! Brings back memories of road trips and super hot summers stuffed in the car. First as a kid and then again as an adult (by this time it was I40 which is dumb and doesn't have the same ring as Route 66). Feeling accomplished now, I'll get to stitching. 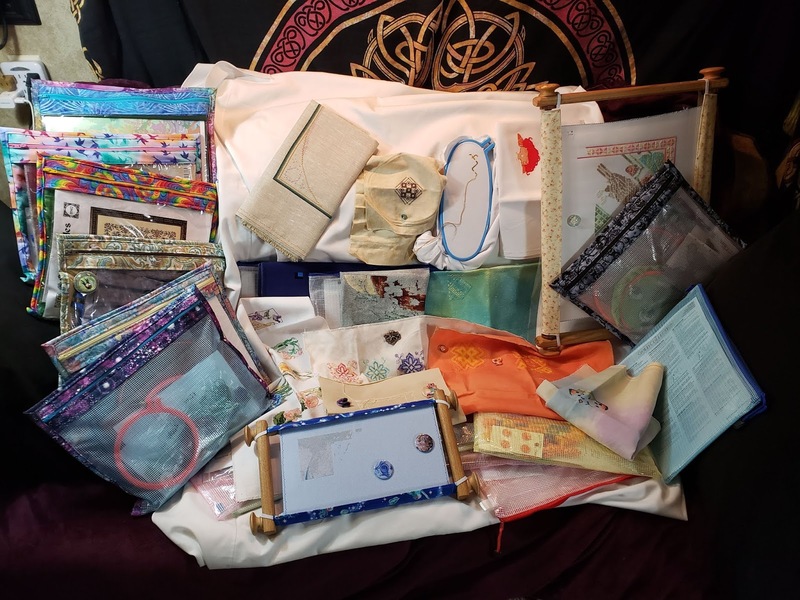 I'm not sewing bags today, but tomorrow should get back to my normal schedule of sewing in the morning and stitching in the afternoon. Have a beautiful day, and according to the birds.....Spring is coming! My family left this morning. One would think I would rush back out to the ol' RV and start stitching. One would be incorrect, sadly. Well, normally one would be correct on so many levels, but not this day of days! 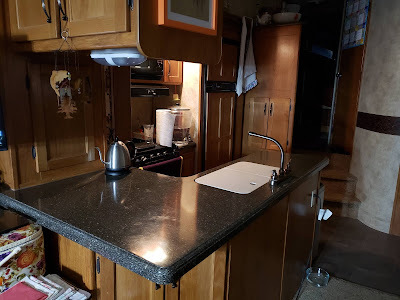 What I did do was combat clean my son's house and then the RV. You are probably thinking, "Why can't your son clean his own house?" 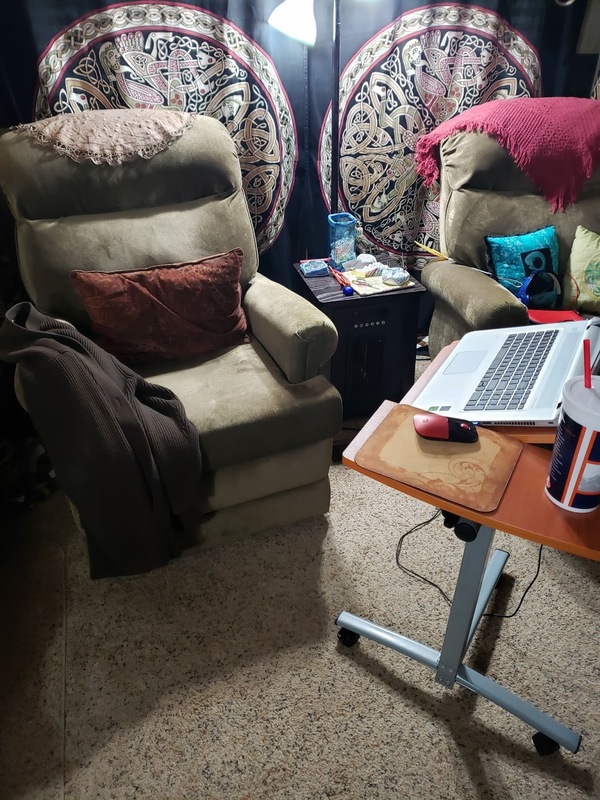 Well, he opened his home to family, he worked for a billion hours on Friday and Saturday and had limited time with the family so today I did my motherly and that was clean. I even fixed his dryer. Not fixed, per se, but there was some serious lint buildup that needed to get out. 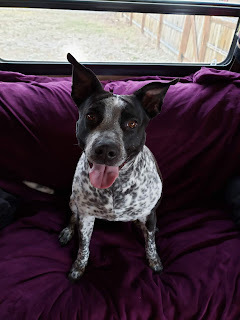 The RV was pretty much clean, just had to fold all the blankets and put the couch back together as a couch and not a lovely bed and then vacuum. 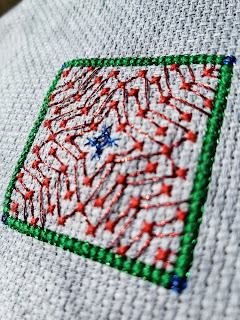 Tomorrow....STITCHING! 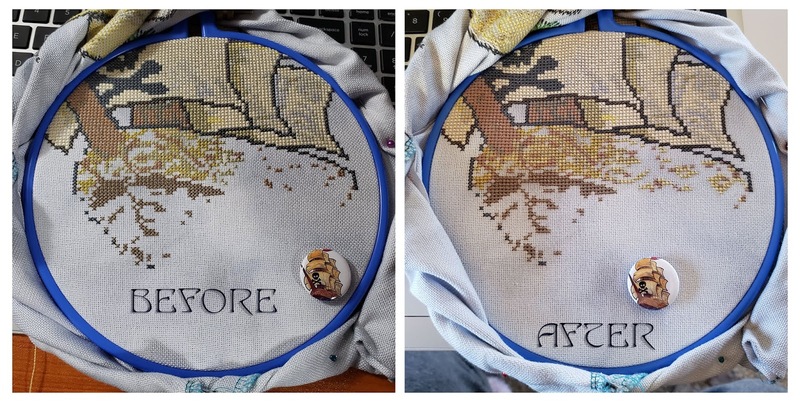 200 stitches on each of my UXS projects: Thordak, Pirate Ship and BAM! Stay tuned for that. If you didn't participate in IHSW this weekend, but like me spent time with family, that's good too. I still feel it's important to still have your stitching time, but this weekend was worth missing a bit of hermitting. Well that's what it's supposed to be, but for me it's family weekend and one night in and I'm beat already! One of my nieces wrestles as does one of my nephews. So far today the niece has been beaten out of the tournament and my nephew hasn't even wrestled yet. I'm hoping they don't have to stay until 9pm tonight, but if they do it's because my nephew is winning in his weight class. It's a sunny, beautiful Saturday and one niece and one nephew are going to the movies with me. I hope that you all are stitching for me since I am unable! It's time for some Gifted Gorgeousness hosted by Jo! I'm a little excited since I have some stitching done on a few pretty things for a few people! 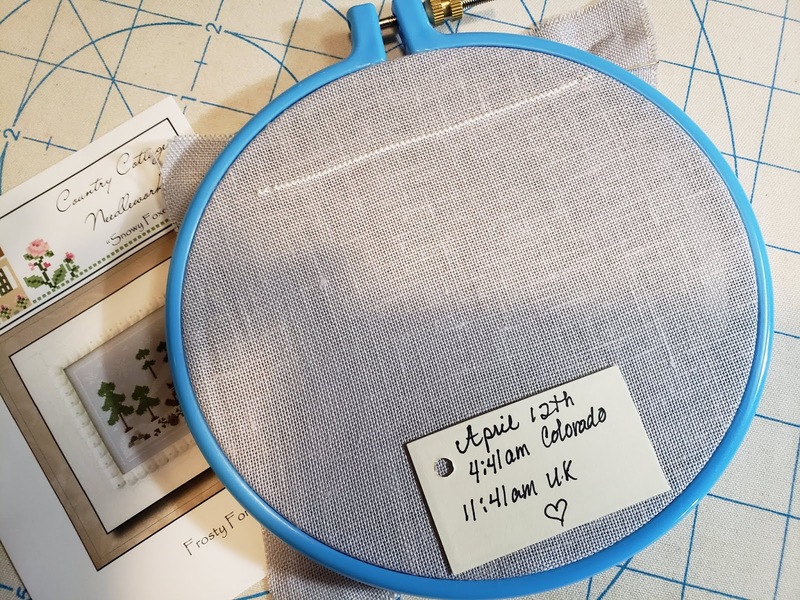 When I decided to stitch a bit on everything I have for my #Stitch9Challenge to put time on my Timesheet app...it was wonderful to touch everything! 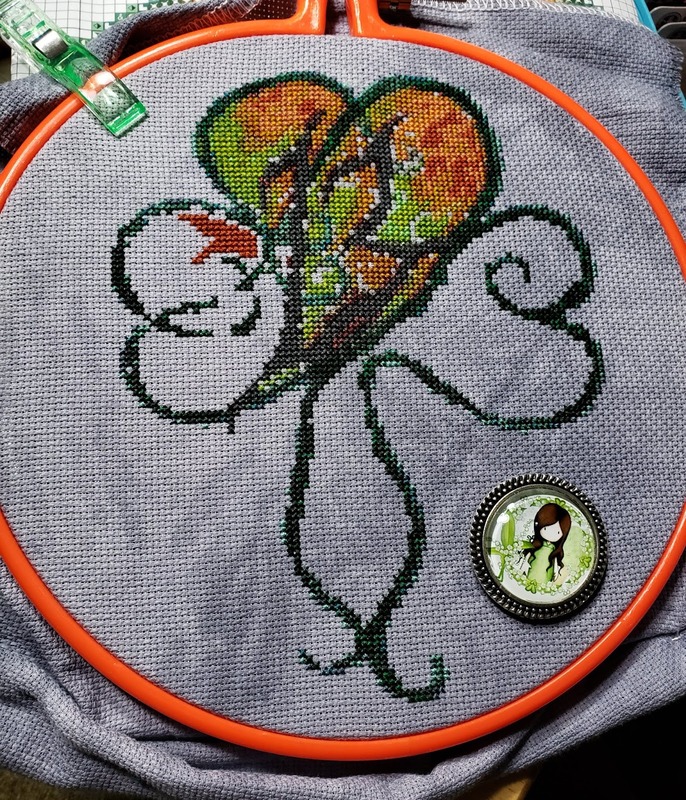 As you know, I set aside Odd Clover because it was making me unhappy, but I had stitched a bit on it after the last Gifted Gorgeousness post so I'll go ahead and share that here. This is for my baby bird who wants this attached to the back of her vest as a patch. It's so pretty so far! While I was touching all of my #Stitch9Challege pieces, I stitched a flower on Tapestry by Ink Circles which is a gift for my lifetime BFF. Stitched that flower on the left side there. I am still debating whether or not I should make a second one so we have matching Tapestries since I really love stitching this one. Next up we have something I've been waiting to start for a year or so! Cute Angel Mermaid, now renamed Blue Angel Mermaid (BAM) by my brother who this is for. I have one page finish so far and the start of another. I seriously LOVE BAM and really want to go to town on it, but I'm rotating. Still, this will get lots of love for the rest of the month and after. My sister and her two live crew will be arriving tonight and I couldn't be more excited! I haven't seen her since the family reunion at Pismo Beach, CA in 2017 and she's only 7.5 hours away by car...we both question why that's a problem, but we both know that work and money play a huge part in both of our lives. Still, with a wrestling tournament in Denver and my son and I offering free room and board, we get some much needed sister time! I think that qualifies for Gifted Gorgeousness as well! The gift of sisterhood. I'm beside myself with excitement. I hope everyone has a fabulous International Hermit Stitch Weekend. 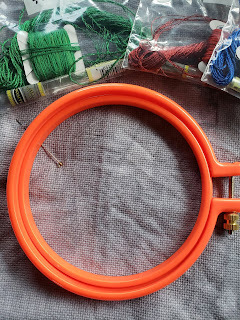 I don't think I'll have time unless I can squeeze in a minute OR (if I'm lucky) teach one of my nieces how to stitch. If you are catching any of that junky weather, stay warm and safe! 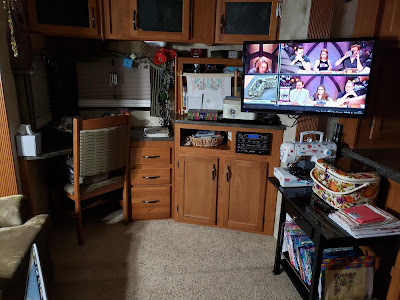 My sister and her clan are coming to visit so I spent today combat cleaning my RV. My son made fun of me saying things like "yeah, it was looking like a homeless person lived here" and "I was worried you were becoming a hoarder". With limited space, it's just easier to have things at hand...that's my excuse and I'm sticking to it! Everything is put away and it's strangely empty looking. Just don't open any cupboard doors...they might explode. 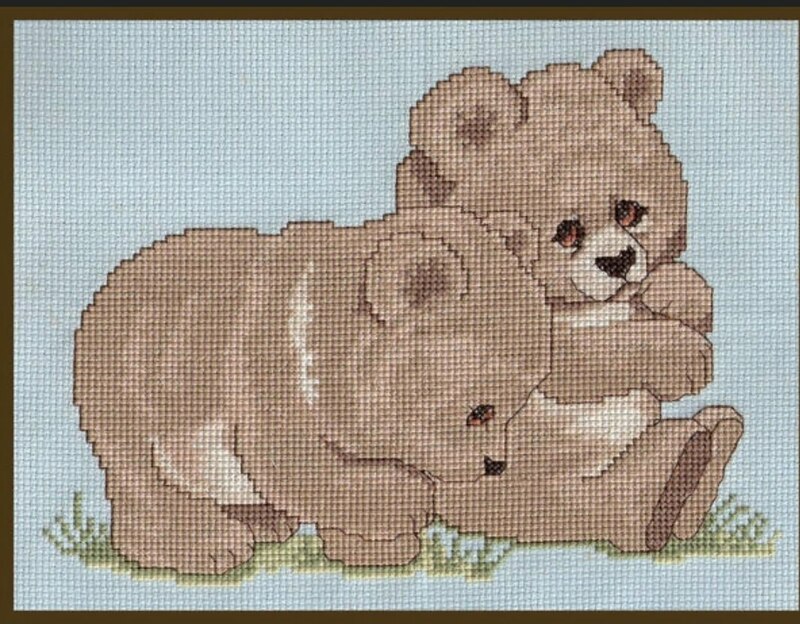 Now I'm too tired to stitch which makes me sad, but the cleaning up is worth it as tomorrow my sister will be here! Pretty sure the clan will all stay in my son's house, but just in case, I have everything ready. It's been awhile since I've shared pictures of my RV, and since I'm proud of the putting things away...here you go! Standing at the doorway you can pretty much see everything, dining area, kitchen, livingroom, and a smidge of the desk area. The desk area which is technically my craft room. It's strange to see the counter tops! And finally a shot of the kitchen. The large counter top where the kettle is, this is the space I put my cutting mat and cut fabric. It's great that each space is multi-functional. Usually the sewing machine is on the dining table, but since I may need the table while the family is here it had to be cleaned off. This part of the RV took many hours to organize and put things away. Normally it might take an hour to clean the RV, but not today...HOURS. It's kind of uncomfortable not having my exploded craft room everywhere! I hope everyone is safe and if the storm that just raged through here is coming towards you please be safe! 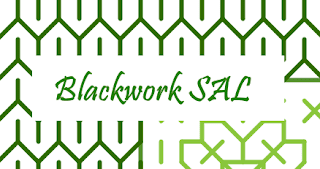 Share book reviews and ratings with The Sacred Order of the Glorious Laborious Book Club, and even join a book club on Goodreads. Unless otherwise stated, everything on this blog belongs to me.. Picture Window theme. Powered by Blogger.